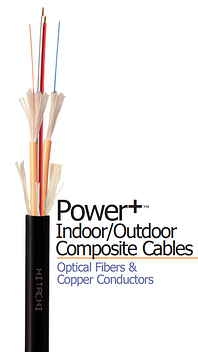 Power+™composite indoor/outdoor cables are the solution for applications where remote power and network connectivity are required and distance may be a factor. Power+ composite cables utilize fiber optic strands to provide the link to the network and a pair of stranded copper conductors to deliver power. The different constructions of Power+ composite cables address the variety of applications on the market. Power+ composite cables are ideal for long distance PTZ camera installations, Distributed Antenna Systems (DAS), and Passive Optical Networks (PON). Power+ composite cables are available with a plenum rating (OFCP) which makes them suitable for a wide variety of environments. Multimode and singlemode glass available (2, 6 & 12 strand). Two copper conductors per cable (choose from 12, 14, 16, 18, 20 & 22 gauges). Stranded copper conductors (7-19 strands) offer greater cable flexibility. Supports 6.49 watts of power (IEEE 802.3af up to 10,000 feet). Supports 12.95 watts of power (IEEE 802.3af up to 5,100 feet). Supports 25.5 watts of power (IEEE 802.3at up to 2,700 feet). UL Listed OFCP for use in plenum spaces. OSP rating permits use in outdoor and wet environments. Small outside diameters assist in installation. Tight buffered (900 micron) optical fibers reside inside individual aramid yarn filled subunits. 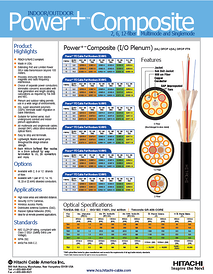 Compatible with all LC and SC fiber optic connectors. Fiber optic glass options include OM1, OM2, OM3, OM4, OM5 & OS2. Mitigates temperature rise associated with cable bundles.